Come create whimsical and creative whole-cloth compositions while learning screen-printing techniques such as discharge, ghost printing, masking, foiling, and layering. Design principles such as unity, repetition, and focal point will be discussed as we play around with thermofax screen printing. 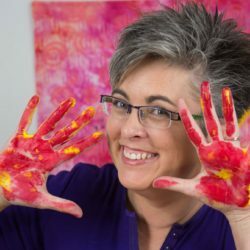 As an added bonus, Lyric will teach you how to mount your finished work on a gallery wrapped canvas, a fabulous technique for a professional presentation of your art. Hair drier, mini iron, gloves, extra fat quarters of hand-dyed or solid/ish cloth (no prints please) to get in some extra printing practice.